It is part of an independently produced set called Entrepreneur Heroes, which profiles famous business people as selected by high-profile bloggers. You can get complete details on the set and buy packs here. Proceeds from the set are donated to Kiva. 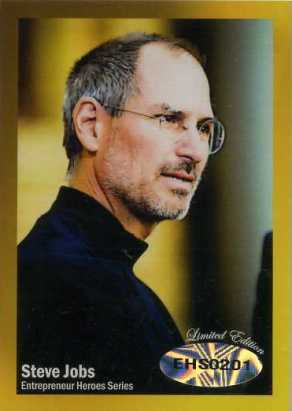 The pictured Steve Jobs gold card was offered to collectors who pre-ordered packs. A similar card was made of fellow Apple co-founder, Steve Wozniak. Both gold cards are limited to 1,000 copies and were never inserted in packs. Thanks to Evan Carmichael, the maker of the cards, we've got two Entrepreneur Heroes prize packs to give away. Each winner will get a special gold Steve Jobs card. One of the winners will also receive with a second gold card of Steve Wozniak while the second winner will get some unopened packs of Entrepreneur Heroes cards. A third prize pack is up for grabs on our Facebook page. Make sure when you enter that you fill in your email address so we can contact you (your email address won't appear on the site). The contest will run until Thursday, November 17 at 11:59 pm EST. Winners will be picked at random. The contest ends Thursday, November 17 at 11:59 pm EST. Valid entries must answer the question, "Who is your hero?" We reserve the right to print the name of the winner on the site. Winners will be picked randomly from valid entries. Prize packs will be selected at random. ITHistory (1989 01) Magazine: MACWORLD "Steve Jobs Is Back NeXT New Machine Ads! for his own ego is expertly impressive, and hilarious! My grandfather. He served in the Marine Corps and protected the President. In the past few years, he’s had bypass surgery, cataract surgery, and a couple of others, yet still travels 300+ miles one-way to visit his kids and grandkids. My Hero is Carroll Shelby the creator of the AC Cobra and Shelby Mustangs. I have always had great admiration for The Woz. While Jobs was always the business side of things, the creativity and genuine love of inventing flowed from Wozniak. Woz is the King of the Nerds, all hail Woz!! My hero is any one going through the diagnosis of cancer and going through chemotherapy. The courage it takes to fight to survive cancer and to know during that fight you may still die is beyond heroic. I would love to see a card dedicated to those heroes. My Step Dad actually, who taught me how to stand up for myself, brought me up like a marine and THAT got me through Boot Camp AND more….not many step dads are Hero’s but mine was. RIP Dad…. I will never forget wha t you taught me and live by it today. Jerry Garcia…Best Guitar Player Ever!!!!!!! My mom, she makes me laugh everyday. My hero has to be Elivis the king of rock and roll. He started what now is the best music in the world. After watching the life of Abraham Lincoln series on PBS earlier this year, I have a greater respect & admiration for the man and the leader he was. So my hero is honest Abe Lincoln.